Black Ice Software - Print2RDP version 6.18 is released! Print2RDP version 6.18 is released! Never worry about having to log off again to Add printers with the latest version of Print2RDP! Black Ice Software has released the Print2RDP version 6.18. This version includes major improvements to Print2RDP, allowing users to Add printer without ever having to logging off from the remote computer. In the latest release users only have to disconnect the session (close the RDP window) and connect again (reopen the RDP session) to quickly and easily Add printers to their session. This new feature significantly improves the user-friendliness of Print2RDP and makes adding printers to your session easier then ever before. 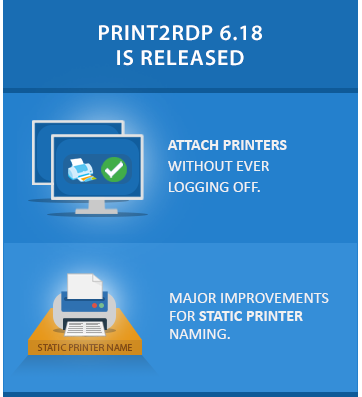 Additionally, the new Print2RDP Client comes with major user interface improvements to make the static printer naming feature more obvious and to help users utilize the static printer naming feature. Furthermore, the new Print2RDP supports mounting printers with Ericom Blaze Client, which is a common alternative for Microsoft Remote Desktop Connection.